We're beginning to suspect someone at the Voice lives in Kensington. 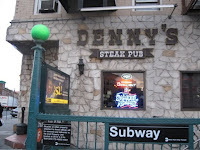 First it was Am-Thai, then Cafe Sim-Sim, and now they've gone so far as to write-up our very own local mainstay, Denny's (Steak-free) Steak Pub. In a recurring feature called Real Dives, the Voice actively seeks out and showcases the diveyist of dive bars around and sends folks in to survey the scene. According to the writer, a real dive bar "may be characterized by low prices, clientele over 60, trucker hats only on actual truckers, ...and a sense that the place is not trying to impress you, or anyone else, ever." Sounds like Denny's to me. So three cheers for Denny's! Still scaring people away after all these years.